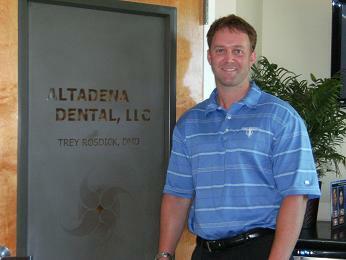 Dr. Trey Rosdick is a native of Birmingham, AL and has lived in Vestavia Hills his entire life. He attended Vestavia Hills High School and then went to Birmingham-Southern College for undergrad. After completing Dental School at the University of Alabama at Birmingham, Dr. Rosdick honed his skills during his residency at the UAB VA hospital, as well as with other dentists during his associateships. He and his team strive to provide the best possible treatment in the most comfortable atmosphere to give his patients an amazing smile and plenty of self-confidence. Outside of work, Dr. Rosdick enjoys spending time with his family and friends whether its on the golf course or cooking out. Some other hobbies include keeping up with the NFL (especially the Chargers), staying fit, playing tons of golf and charcoal drawing.